This is the inaugural issue of a quarterly outlook, assessing the latest developments in distributed energy and electrification in emerging or remote markets. This issue includes spotlights on Nigeria and India, as well as global updates on market fundamentals, project development and financing. 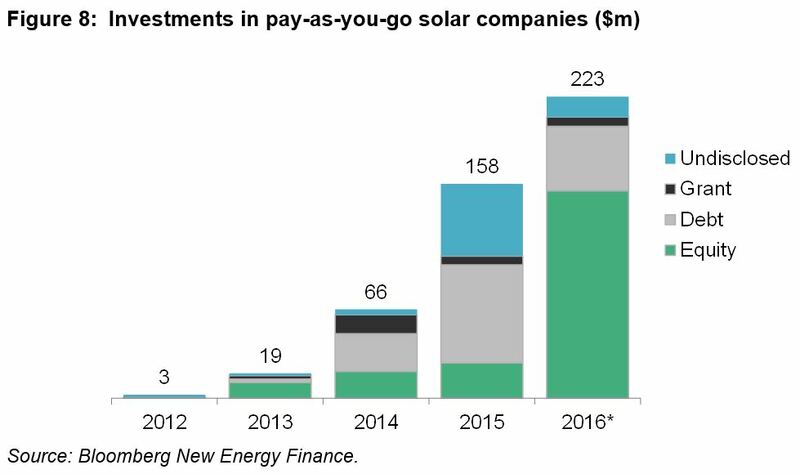 Pay-as-you-go solar companies continued to dominate investments related to energy access in 2016, with more than $223m of funds announced. Of note, two Africa-focused private equity funds recently invested in pay-as-you-go solar home system companies, which are increasingly viewed as a new category of infrastructure investment. The closing of Mobisol’s equity round from Investec and Lumos Global’s round with Pembani Remgro Infrastructure Fund signals that pay-as-you-go solar is becoming a commercial opportunity. While financials were not disclosed for either deal, both break the previous trend of transactions being driven primarily by impact investors and donor capital.